When Your 4th Grade Son is Called "Gay"
I guess it’s the inevitable happening. But I was hoping it wouldn’t. My 9-year-old gender creative son has become acutely aware that most of society thinks a little boy owning stereotypical “girls’ stuff” is inappropriate. Though he boldly chose, and wears to school a backpack matching his personality: a glittery rainbow explosion of kittens, hearts, and cupcakes, in 4th grade, he is excluded by peers. Almost overnight he has learned the ugly truth about gender stereotypes. In our house, we don’t have “boy toys” or “girl toys.” The understanding for our family of five is that we just have “toys,” and everyone can play. My son doesn’t look or act like most other boys his age. 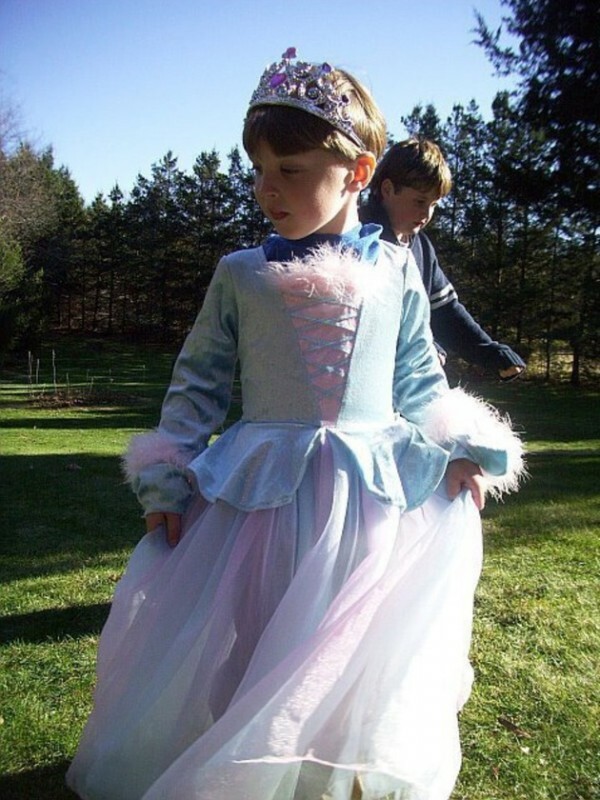 At nine, he self-identifies as “gender creative.” This means that he does not want to change his anatomy, or be a girl; he simply prefers all things that are marketed to girls (such as clothing, pajamas, shoes, toys, games, movies, décor, dress-up, and accessories – to name a few), and he typically prefers hanging out with girls. While we are fortunate that most of the people in my son’s school are pretty cool, and he has received several compliments on his “girly” backpack and sparkly accessories, he has also been ostracized. He has been the target of unkind words, nasty looks, assumptions, and cold shoulders. Not just because of the backpack, but what the backpack represents: my son’s whole persona. It’s in the subtleties – the way he flinches when bugs fly near him, how he squeals with delight in high-pitched voice, cares for others with a tender, mother-like quality, wears knee-high rainbow striped toe socks with shorts, the way his voice sometimes goes all Valley Girl, circa 1985. It’s somehow ingrained on his DNA, and it makes him uniquely HIM. Last month, the phrase happened for the first time. During lunch, another 4th grade kid walked by my son in the lunch room, leaned in to him and scoffed,“You’re gay.” My son did not respond. He was in shock and didn’t know what to say. When he recounted the story later to me, though, he was embarrassed beyond words, holding back tears. I did the only thing I knew how to do – held him, listened, and told him that 1.) There’s nothing wrong with “gay,” 2.) Other people’s words do not define you, and 3.) Please continue talking to me. You’ll always have my support. We brainstormed ideas of what to do if someone says this to him again, but it’s always easier to plan than to execute in the moment. I’ve been hastily preparing for this day, I’ll admit; the day that someone would cross that line and move from saying “you’re weird” to “you’re gay.” The day that someone would associate my son’s effeminate tendencies with being homosexual, when sexuality is not yet even on his radar. The day when someone would take the word “gay” and wield it as the ultimate male slander – as a means of intimidation, an effort to emasculate, humiliate, and crush another human being who doesn’t conform to gender stereotypes; a way to communicate one’s absolute disgust, intolerance, and outright bigotry. This upsets me on many levels, but mainly because my son knows that the word “gay” does not mean “stupid,” as so many kids tend to interchange the two. He knows what gay means because of the wonderful LGBTQ friends we have in our family’s life. He knows what it means to actually be gay. He has heard of one of our friend’s struggles throughout the tormenting years of middle school. He has heard of middle school boys gym class, when the door of steel slammed shut, and the boys locker room morphed intoLord of the Flies - the hefty jocks pitted against the nerdy, scrawny, or especially, the effeminate boys. He has heard the story of another friend who came out gay in high school in the ‘80’s, when the new threat of AIDS was fueling our nation’s ignorant paranoia, and gay teens were being kicked out of their homes. He knows how awful these friends were treated, how they were verbally and physically abused by either family members or peers at school, and sometimes both. And now – now, he knows about the Orlando massacre in Pulse Nightclub. Pulse Nightclub: a sanctuary and safe place for the LGBTQ community, located in the heart of Florida. Orlando, Florida — the place of Disney World and dreams, i.e., “the happiest place on earth.” Now Orlando is known for being the location of the deadliest mass shooting, and worst LGBTQ hate crime of recent U.S. history. My son knows that our family is liberal, and that we don’t share the outdated, prejudiced views about the LGBTQ community the way some others do. He knows that when he comes into his own sexuality, our family has only this request: that he’s happy and treated well. He knows we’re allies to the LGBTQ community. He knows, but knowing is unfortunately not enough. I naively thought if we loved him enough, and showed him how accepting we were, it would be enough. I’m learning it’s not. Because no matter what his father and I tell him, no matter how much his older sister and brother tell him, “it gets better,” he still has a world of politicians, radical religious zealots of all denominations, peers, adults, media, and more, all sending him the very clear message that as a gender non-conforming person, he’s not protected. Now, because of a couple of carelessly spewed words that will certainly be repeated over again, my son will soon be forced to wonder if he’s gay, because other kids are now saying it out loud. Though he doesn’t know what a self-fulfilling prophecy is, I have seen the confusion and anxiety on his face more in 4th grade than ever. Of course, adolescence and puberty are almost within hand’s reach. However, when going into the tumultuous years of adolescence (which is already hard enough for anyone) my son is now going in with the additional, excessive worry of, “am I gay?” He knows that our family doesn’t care, and we will continue to love and support him no matter what. But I’m learning that just because we’re okay with it, that doesn’t mean it will be easy for him to go through – whether he’s gay, bi, trans, asexual, or questioning – if he’s basically anything that varies from cisgender, straight male, he’s not protected; he is subject to legal discrimination. He is subject to hate crimes. He is even subject to the subtle (but repetitive and tiresome) day-to-day discrimination. Most of us don’t understand the more subtle acts of discrimination. When you see it happen to your child, though, it’s extremely painful, because you realize that people don’t even know they’re doing it. It is born out of assumptions, and we all know what happens when we make assumptions. Adding insult to injury, just when we thought society had made considerable progress towards the acceptance of the LGBTQ community, we stepped backwards in history about 40 years. My home state of North Carolina just three months ago made House Bill 2 into law, which is unarguably the worst, most sweeping anti-LGBT law in U.S. history. I’m doing everything I can to fight against it, from calling and writing my representatives, to starting up a gender creative playgroup/parent support group in our area this summer. But I’m only one person, and I feel powerless against the massive tide of conservative power right now - conservatives who won’t be swayed, and are blind to the outright (and even subtle) discrimination that our LGBTQ brothers and sisters endure every single day. What does subtle discrimination look like? Last year, during our school’s annual PTA basket raffle, my son and I were having a sneak-peek at all the lavish baskets available for auction. He stopped to admire one in particular: The American Girl Doll Basket. Included was a blonde-haired, blue-eyed American Girl Doll, two outfits, and a white, lacy, frilly, doll-sized canopy bed. My son’s jaw dropped while he stood in admiration, having previously been unaware of the American Girl Doll Collection. (I have been, for years, cleverly hiding and recycling those dang catalogs we didn’t ask for but receive, because I know my son would want one, and I can’t justify the expensive price tag and upkeep for those dolls). But there she was, in all her American glory. My son reached out his hand and caressed the doll’s hair gently, saying, “You’re so beautiful. I wish I could have you, and brush your hair.” Shortly thereafter, an adult woman walked by, saw what we were looking at, casually smiled and said, “Oh! That’s going to make some little girl really happy! !” As she continued breezing by, my son’s words disappeared into the thin air behind her as he muttered, “…or some little boy...” An innocent comment, from a well-intentioned person, but destructive nonetheless, because before that moment, my son was innocently naive to the fact that most everyone thinks only girls could possibly enjoy dolls. Similarly, from the first day he wore his sparkly “girls” backpack to school this year, several kids regularly gave him strange looks. Adults, too. In fact, one adult approached us on the way into school for small talk and commented, “I see you got your sister’s hand-me-down backpack,” chuckling at the cleverness of his own joke. My son stared at the ground, embarrassed, and not laughing while I gently told the man that “actually, my son had chosen it himself.” Awkwardness ensued, and we shrugged it off, but after the 18th or 20th of these such daily comments, my son could’ve easily decided to tuck his sparkly rainbow backpack in the corner of his bedroom closet where it would be hidden. He could’ve easily swapped it out for his old one – a neutral shade of pastel blue that he did not pick himself – and have a much easier time walking into the school building every day, blending in with the rest of the boys. But, he has bravely and independently chosen not to do that. Instead, every day, I watch in awe as this 4th grade boy of mine straps on a “girly girl’s backpack,” wears it like a warrior shield, and in the process, gives a collective “sorry, not sorry” statement to all those who dare to judge. His bravery, day after day, in this single act of noble defiance makes me feel like maybe I’ve done something right after all. I wish it wasn’t so, but I have to realize that I can’t spare him of the “gay” slander, as much as I want to. I can’t stop kids from ignoring him, mocking him, or saying, “you can’t play with us.” I can’t stop the weird looks. I can’t stop the judgment. I can’t guarantee him dignity. As a parent, it’s heartbreaking to know that your child has to be brave just to be himself. I can’t stop the subtle discrimination that chips away at his foundation day after day. Hell, we can’t even offer him legal recourse or protection for such discrimination. Despite all of this, despite knowing the risks of letting him be himself, I wouldn’t have it any other way. He’s just exactly the type of human I want to raise. Martie Todd Sirois is an award-winning performer in both musical and non-musical theatre, an educator, and a blogger/writer/speaker about life with a gender creative child, and parenting in general. Her blog has often been featured on the front page of both The Huffington Post and The Good Men Project. Martie has also shared her writing during the Listen to Your Mother Show (RDU, 2016), and on radio on "The State of Things" with Frank Stasio on WUNC/NPR, and on "Tell Me Everything" with John Fuglesang on SiriusXM Insight. Martie is the founder of S.E.A.R.CH., (Safe Environment for the Acceptance of Rainbow CHildren), the first Gender Creative Playgroup for Kids/Parent Support Group in NC, and leads it as a program of the LGBT Center with her very supportive husband, Matt. Martie is also a Southern Advisory Council Member for the Family Equality Council, a national organization exclusively dedicated to securing justice and equality for LGBTQ parents and their children by advancing social justice for all families. Martie loves living and volunteering in her hometown, with her husband, their three beautiful children, and their two peculiar but lovable, elderly pets.